JACKSON, Minn. (June 27, 2018) – The “Madman” Kerry Madsen put on a show during Friday’s fair race at Jackson (Minn.) Motorplex featuring the Arctic Cat All Star Circuit of Champions presented by Mobil 1, ultimately battling through a four-car fray near the midpoint of the 30-lap program to solidify a $10,000 payday. Madsen, who now owns eight All Star Circuit of Champions victories over the course of his storied career, started fourth on the feature grid and took the lead officially on lap 16, driving by race-long leader, Josh Baughman, with a power move on the cushion. 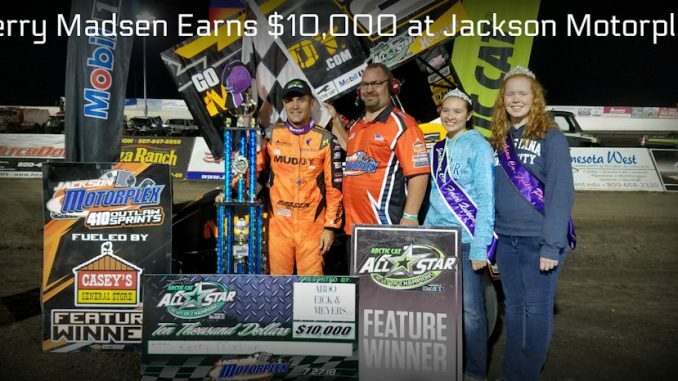 The All Star victory was Madsen’s first of the 2018 season. With two events down and two to go, the Arctic Cat All Star Circuit of Champions presented by Mobil 1 will continue their four-race trek through the Midwest with a one-night stand at the Sprint Car Capital of the World – Knoxville Raceway in Knoxville, Iowa, on Saturday evening, July 28. Tony Stewart’s All Stars have made 16 prior appearances at the world-famous Marion County Fairgrounds, but only two repeat winners have been crowned. The last All Star visit to Knoxville Raceway took place in 2011 with Kevin Swindell taking the final checkers.